Johnson, R.I. 1984. 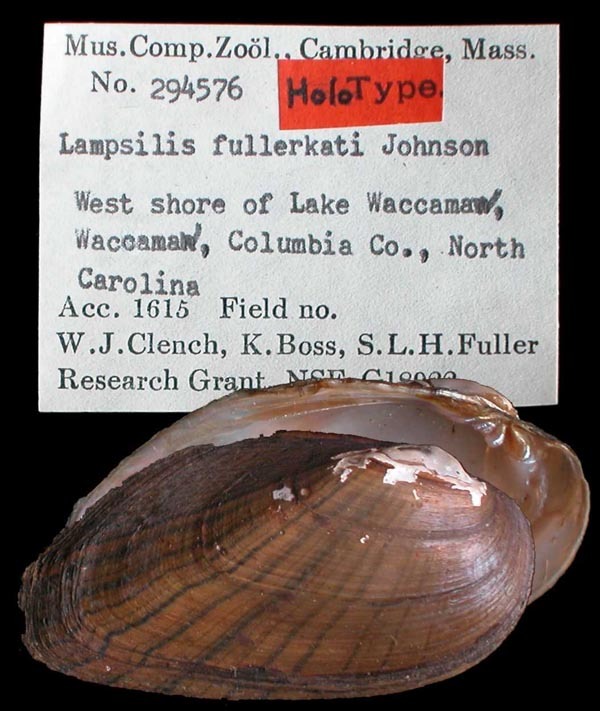 A new mussel, Lampsilis (Lampsilis) fullerkati (Bivalvia: Unionidae) from Lake Waccamaw, Columbus County, North Carolina, with a list of the other unionid species of the Waccamaw River system. Occasional Papers on Mollusks 4(63): 305-319. Lampsilis (s.s.) fullerkati R.I. Johnson, 1984. Kat, 1983, J. Moll. Studies: 133, fig. 1B [as ‘Lampsilis sp.’]. R.I. Johnson, 1984, Occ. Pap. Moll. : 307, fig’d. Type(s): HOLOTYPE MCZ_294576, West shore of Lake Waccamaw, Waccamaw, Columbia Co., North Carolina.